Welcome to the "Woodsy Christmas" new release from High Hopes! 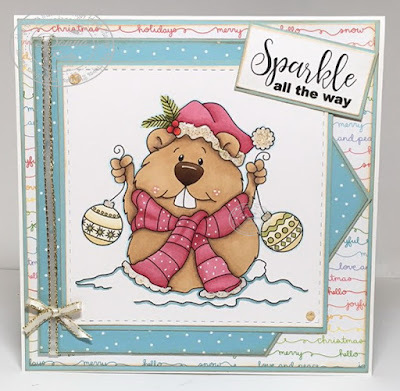 I am super excited to introduce you to "Christmas Gofer". How fun is this gofer, trudging through the snow just to get the Christmas ornaments to the tree! And those teeth - so fun!!! 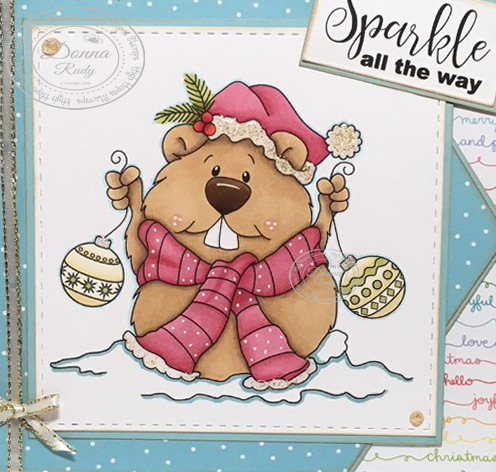 I stamped my gofer and coloured him/her with alcohol markers and Prismacolor pencils and cut it out using a stitched square die. I added some Nuvo glitter drops to the trim on the hat and the top of the ornaments. I thought some non traditional rainbow Christmas paper was perfect for this fun stamp. After inking the edges of all of my paper and card stock I added some ribbon and glitter drops to finish off my card. Be sure to stop by the website to see the full release! Gofers, raccoons and bears oh my!!! Oh My Gosh, he is just the cutest little guy ever. I saw this in person and it's incredible!! Love the polka dots and added glitter! Another awesome design by you! !